Apples - fresh, dried, puree or juice – are they still good for you? Written by Catherine Saxelby on Wednesday, 03 August 2016. Processing is getting a bad rap in the news but it really isn’t all bad. The general rule of thumb is that the more processed a food, the less fibre and fewer nutrients it has, but not always. That’s a point often forgotten in popular blogs. There’s way more fibre in a dried or concentrated fruit product than in a piece of fresh fruit. Removing the water concentrates what’s left so the fibre content goes up. Compare fresh grapes to their dried equivalent sultanas or raisins. You’ll see there’s three times the fibre weight for weight. Processing of tomatoes into tomato sauce or passata ruptures the outer cell wall which then releases much of its lycopene, meaning there’s more lycopene and it’s more bio-available. Lycopene is a fat-soluble red pigment that occurs naturally in tomatoes, watermelon and pink grapefruit. It’s related to the beta-carotene in carrots and pumpkin. It was under study for a possible role in preventing prostate cancer in men a few years ago but now the studies aren’t that convincing. Take a look at these six products derived from fresh, whole apples and see how they’ve changed. Nothing beats biting into a whole fresh apple especially one that’s crisp and sweet. Regardless of whether it’s a Jazz or Royal Gala or Pink Lady, they are similar in nutritional value. They have around 12 per cent fruit natural sugars with almost no starch, protein or fat. What’s more they contain fibre and polyphenol antioxidants. Dried apples are nutritious, having no fat and plenty of vitamins, minerals, antioxidants and fibre. They are the fruit with much of its water removed. Mine (pictured) take two days of drying in the dehydrator. Moisture drops from around 90 to 15 per cent. But remember, that it's apple in concentrated form so it's easy to over consume. One apple equals around 5 or 6 rounds of dried apple but you won’t feel as full afterwards which is a danger for anyone on a diet. Most commercial dried apples have preservative added in the form of sodium metabisulphite or sulphur dioxide. Look for the listing on the Ingredient List of “Preservative 223” or “Preservative 220”. If you’ve ever made your own puree, you’ll know that you discard the peel and pips and add a little sugar and lemon juice for vitamin C and to prevent the apple turning brown. So it is with commercial puree which can be 100 per cent apples OR 95 per cent apples with a little pear juice concentrate. Most have some added vitamin C (number 300) for its antioxidant properties but because of the lack of skin, the fibre has dropped greatly. I keep a can of pie apple handy for my apple desserts. It’s pretty healthy usually being simply apple slices peeled and canned. I tend to mix it in with 4 or 5 whole apples that I stew so I end up with a lovely flavour and texture. It saves me the task of peeling 8 or 9 apples. Again what you lose is much of the fibre. The freeze-dried apple pieces I can buy are pretty dreadful – sweet, crisp like a prawn cracker and they resemble nothing in nature. 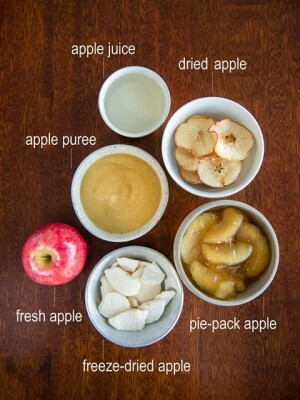 Yes, they too concentrate the nutrients as they remove the moisture so similar comments apply to dried apple. If you’ve ever done juicing at home, you’ll know that it takes 4 or 5 whole apples to make one glass of juice. There’s a lot of waste. Only drink small quantities of juice, say ½ glass, as it has little fibre and lots of sugars (yes, even though they’re natural ones). See my post on the pitfalls of juices here. Most commercial juices are reconstituted as we don’t have fresh apples all year round. They often have malic acid or food acid (296) added for tartness, vitamin C which works to protect the juice from going off, and a preservative such as potassium sorbate (202). Many fruit leather products have apple puree as their underlying main ingredient as it’s inexpensive and bland in flavour. It won’t overtake the advertised flavour of apricot, mango or strawberry. Fruit leather is concentrated in fruit sugars - a hefty 60 per cent of natural sugars (mainly fructose but also some sucrose and glucose) even though there's no added sugar. It's something to eat in small quantities. Being sweet and sticky, it can stick around the teeth and set the scene for tooth decay. Remember there’s something about eating the intact cell structure of an apple. All that chewing. All that fibre and juiciness. When that structure has been disrupted (as in puree and juice), it means the food is easier to overconsume. That’s why whole foods are so important when you’re trying to lose weight. Take care. Be aware with processed apple products. Not ALL processed foods are “bad”. Some obviously are, but many are very useful and are nutritionally similar to the fresh version that you’ve cooked yourself e.g. canned chick peas, frozen peas, etc. Ditch any highly-refined and processed products and use the ones that add nutrition and look the closest to whole food. Thank you to dietitian Emma Stubbs for her assistance in researching the background for this post. You’ll find more great posts from Emma at https://broccoliandblueberries.com/. Q. Are dried fruits as good for you as fresh fruit? Is there a limit on how much you can eat?